Today I will be sharing some tips as well as my go-to products when it comes to getting my skin summer ready. 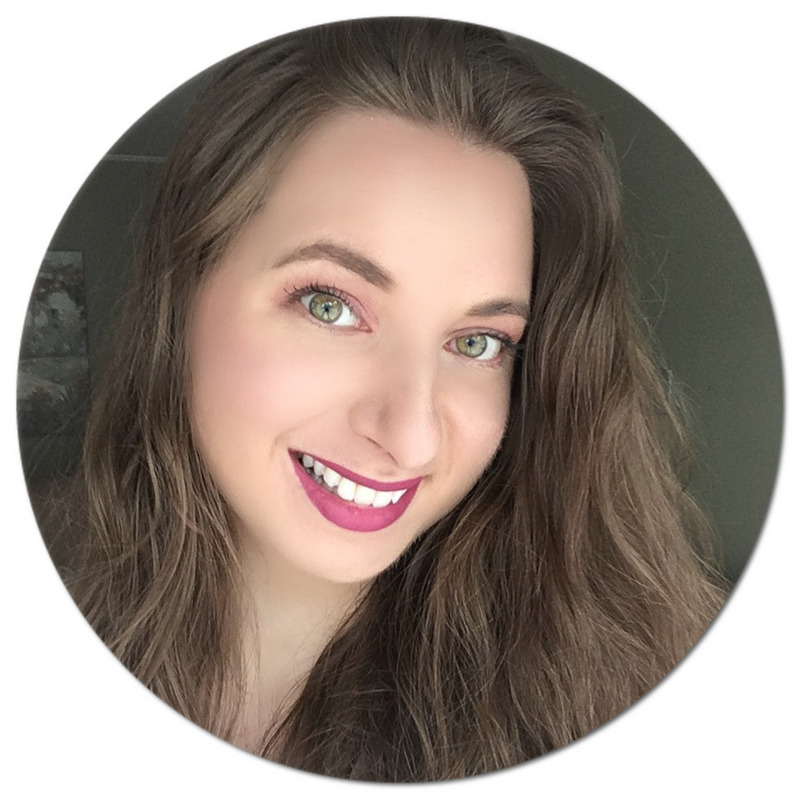 This was originally written as a guest post on blog Workaday Ramblings - I was selected as the Canadian Beauty Bloggers' Blog of the Month in May and thus invited to join in on their monthly round of guest posting with the theme being transitioning to warm weather. With summer being hands down my favourite season (I actually very much enjoy the heat and just being outdoors! ), I thought I would share here on my blog as well since summer is almost officially here and hopefully these tips can help you with a smooth skin care transition. One thing I cannot live without ever since I read about what it can do for our skin is a dry body brush. The technique of dry body brushing is beneficial all year long, but especially in the warmer months when us ladies are exposing our skin more often and for prolonged periods of time. The one I use is The Body Shop's Round Bath Brush, and I just basically scrub my body before showering when it is dry, with the exception of my face, always stroking towards my heart. It is said to help blood circulation while also getting rid of dead skin cells, leaving the skin silky smooth. I have definitely noticed a difference, and whenever I haven't done it in a while and remember to dry body brush I immediately regret neglecting my skin for so long! You can read more about the benefits of dry body brushing here. 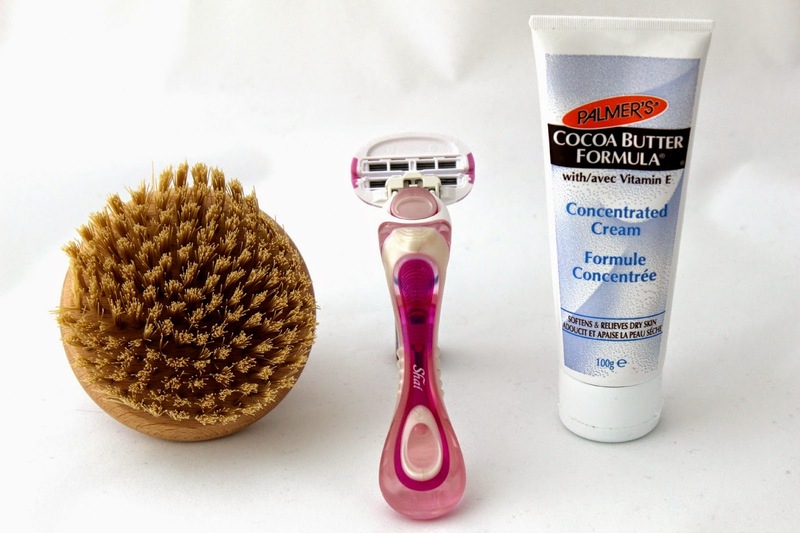 Since us ladies have a tendency to shave more often in the summertime (or at least I do), it's important to find a good razor that will be gentle and won't constantly cut our skin like I have experienced time and time again. I've recently been using the Dorco Shai Soft Touch 6 Blade Razor (reviewed here), and it has seriously done wonders for my skin. I normally always cut myself during my first shave with a new razor, and with this one by Dorco I didn't have that experience. The head is very flexible and makes achieving a close shave effortless without the unwanted pain. Once I'm out of the shower, I make sure to moisturize my body from head to toe. Whenever I skip this step I notice my skin becoming flaky extremely fast, and that is not fun (or appealing for that matter) in the summer when my legs and arms are most often seeing daylight! Any heavy duty body cream will do wonders for this issue, and I've been especially loving Palmer's Cocoa Butter Formula range, more specifically the Concentrated Cream since it is packed with ultra hydrating ingredients and smells just like chocolate! To read about what other products I enjoy from the line, you can click here. Protecting my skin from the sun is something I take seriously, and although I won't lie when I say I like to be out in the sun, I always make sure to layer on the sunscreen to protect my skin from harmful UV rays. For my face, I prefer using a sunscreen that is more liquid and that absorbs more quickly, and I've recently been using the La Roche-Posay Anthelios Ultra-Fluid Lotion SPF 60 (reviewed here). It's actually unbelievable how light this lotion feels on the skin, and if you are someone who doesn't like the scent of sunblock, this one would be great for you since it is scent-free. It can be used daily, and it holds up well under foundation as well since it doesn't leave a greasy feel and won't clog pores. The sunscreen I have been using for my body for the last couple of years is the Hawaiian Tropic Sheer Touch Oil-free Sunscreen Lotion SPF 30. It is recognized by the Canadian Dermatology Association, which is something I always look for in a sunblock. This one smells sweet and fruity as it contains moisturizing ingredients such as shea butter, mango seed butter, aloe leaf juice and papaya fruit extract - it's basically a tropical vacation in a bottle! We sometimes forget, but our lips need sun protection too. I make sure to use a lip balm with a SPF factor, and the one I am using at the moment is the Blistex Raspberry Lemonade Blast with SPF 15. Having a lip balm with sunscreen is so important since our lips can easily get burned by the sun, so taking that extra precaution will keep you from catching a sunburn on your lips.. ouch! Last but not least, an essential for me, especially in the summer, is a makeup setting spray. Not only does it make my makeup last longer in the heat, but it is also a great mist to have in your bag when you are on-the-go and are in need of a pick-me-up to keep you cool and your face looking fresh and hydrated. The NeoCell Refreshing Herbal Mist (reviewed here) has quickly become my favourite. It is all-natural and infused with herbs, collagen, and vitamins that will instantly moisturize your skin! And there you have it, my skin care tips and product recommendations for a smooth (and sunburn-free) transition into the warmer months! Let me know in the comments if you have any other tips and/or recommendations that you swear by to be summer-ready! Omg why have I never heard of that body shop brush before, must buy!! I went a bought the La Roche-Posay sunblock after I read your post on Sarah's blog. It sounded great and just what I'll need this summer - although I have not tried it yet. Dry brushing is still something I've yet to try because it sounds like such a hassle for a lazy person like me! (But I'll get around to it..someday...along with oil pulling and all those other shenanigans!) 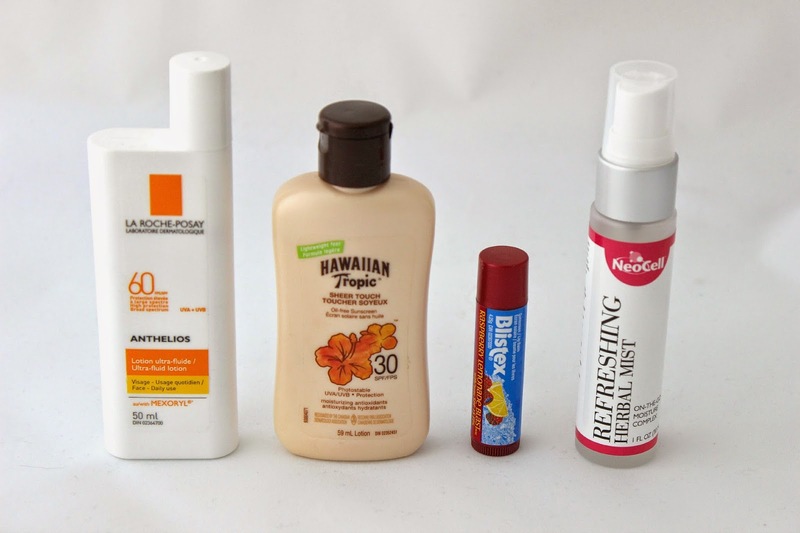 I really want to try that La Roche Posay sunscreen now, because I love lightweight sunscreens! I picked up the Clarins sunscreen last week because it is so darn lighweight and dries matte on the face! And Hawaiian Tropic CAN DO NO WRONG WITH THEIR SUNSCREENS. THEY ALL SMELL AMAZING! I've always heard about dry brushing, but I've never really considered trying it out myself. Maybe this is the summer to start if it makes such a difference! 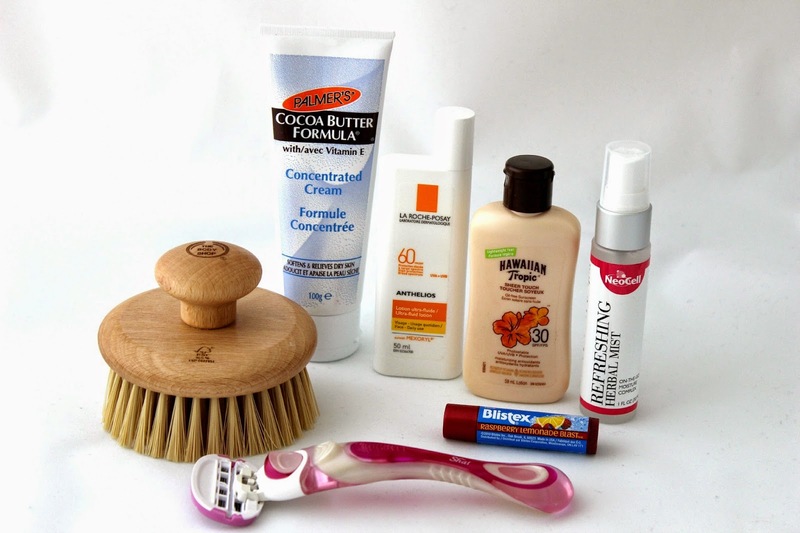 i love the cocoa butter formula and i think all the products that you featured here are good to our skin... Love to try this.